Daniel had been staring at it for three minutes. It had been the first thing he noticed when he walked through the door, splayed across the kitchen table as though it belonged there. The commander’s severed arm, and no sign of its owner in sight. Perhaps severed wasn’t the best way to think of it. Certainly he should never refer to it that way in the commander’s presence, though it was hard to think of any limb sufficiently detached from its body of origin in any other way. It was Domerin Lorcasf’s bionic arm, a perfect blend of the biological and technological, the only way they had been able to preserve it after the explosion that tore it to pieces. Every time Daniel had seen it disconnected from the commander’s body, it had been enshrouded in a clear glass case full of wires, microchips and some sort of bio-sustaining fluid that kept the organic portions from breaking down. Inching forward, Daniel dared to lay his fingers against the organic portion of the arm just below the blue-glowing bionic wrist. It was warm. Did that mean it hadn’t been disconnected long? Or was it always this warm, even while disconnected from Domerin’s body? All at once, Daniel snatched his fingers away and glanced over his shoulder, worried the commander might somehow feel the touch from the other side of the ship – or wherever he was. How far a range did the sensors on his shunt have? He wouldn’t be surprised if Robin rigged them to work wirelessly. Now that he took a second look at the device, he could see the metal socket above the elbow connected to some portable device trailing a spider web of wires. It must be how Robin kept the organic blood flowing while the limb was disconnected and resting outside its protective casing. “Robin?” he called, finally shaken from his trance. It was Henderson that answered with a sharp bark from the kitchen, his tail thumping hard against the tile floor. Daniel followed the sound; wherever Henderson was, Robin wouldn’t be far behind. He bent in the doorway to scratch behind the dog’s ears. At least someone was always glad to see him when he got here. Then he glanced up to find his girlfriend leaning on the counter, dark eyebrows lifted in question. She was holding a paring knife in one hand and an apple slice in the other. It was poised just beside her lips, as though she had frozen in the act of devouring it. And despite his trepidation, this image made him smile. “Something wrong?” she asked when he didn’t speak, catapulting the apple slice into her mouth as she turned back to her chopping. “Er…” Daniel started, uncertain how to put this delicately. But he had learned to tread lightly where Robin’s father was concerned. It was a sensitive subject. “I was just wondering…” Spit it out already! Daniel drew a deep breath. Robin laughed and shrugged, as if he had just commented on the weather or the structure of a passing nebula. It was all Daniel could do not to comment; he bit the inside of his lip instead. “G…great,” Daniel managed, hoping against hope she didn’t expect to keep her father’s severed – bionic – arm in the middle of the table while they ate dinner. When Domerin’s bionic arm occupied a room, it was hard to notice anything else. It was in its cylindrical glass case now, surrounded by a delicate nest of wires, suspended in a transparent, viscous fluid visible only because of the bubbles that slowly meandered their way through it. Robin handled the case with great care as she set it on her nightstand, shimmying it toward the exact center of the table where it couldn’t be knocked to the floor even if she managed to bump it while reaching for the alarm. She grinned when she was satisfied, flopping herself onto the bed beside Daniel as she lifted her pad for perusal. Usually she read before she settled in for the night. Novels, sometimes, but more often schematics or manuals that Daniel didn’t really understand. Tonight she must be going over her notes. Daniel didn’t look at the screen for confirmation. He was too busy staring at the commander’s arm. Even in full darkness it would be impossible to ignore, the dim blue lights glowing beneath the too-pale skin serving like a beacon in the night. For a moment, she stared at him over the top of her pad, as if she didn’t understand the question. It was enough to make Daniel wish the bed would swallow him. At least then he wouldn’t have to see the arm looming over her shoulder, as if it were the commander’s scowling face. “Stuck?” Daniel pressed, his voice much higher in pitch than he anticipated. There were a dozen questions he could have asked in this situation. The first, the one he normally asked by gut instinct, was what – exactly – was wrong? What was she trying to do? And why wasn’t it working? Unfortunately, he rarely understood the answers to these questions. Robin understood both biology and engineering on levels Daniel couldn’t hope to comprehend. She would start tossing around terms and his eyes would glaze over. There were likely to be amino acids and various forms of circuits they weren’t properly interacting with, and in the end he would simply have to nod while he silently admitted defeat. Tonight, he decided to skip all that and ask the question he really wanted answered. “How is sleeping in the same room with it going to make any difference?” How did she even expect him to sleep with that thing in here? Now her dark eyes grew hard and Daniel wished he hadn’t spoken at all. It was too late to pretend he had fallen asleep; he was pinned beneath the intensity of her gaze. That was true. She did often set up projects on her bedside table so they could be resumed at a moment’s notice. And the number of times she turned on the overhead light, blinding him out of sleep so she could accomplish that work wasn’t worth counting. When you loved a woman as brilliant as Robin Lorcasf, you didn’t question the quirks that came with her. But how the hell was she going to work on that arm without spilling its protective fluid all over the place? “R…right,” Daniel murmured. It was almost a whimper. When Robin deactivated the lights, the blue glow of the bionics intensified, like a tiny lighthouse sitting just over his girlfriend’s shoulder. Daniel spent most of the night staring at it, begging sleep to spare him. But sleep refused to come. Domerin Lorcasf was obviously startled when he turned. Not by the fact that someone snuck up on him – Daniel was reasonably sure the man knew he was there. More likely it was the fact that Daniel Barrette came seeking him on the bridge. It wasn’t likely him; he wasn’t really high enough rank to get away with this, and he didn’t like taking advantage of the fact that he was dating the man’s daughter. But if he had to spend a third night with the man’s arm blazing like a sun from Robin’s nightstand, he might just go mad. “Can we talk for a minute?” he asked in answer to Domerin’s expectant stare, so similar to Robin’s it made Daniel’s skin crawl. As strange as it had been to see the commander’s bionic arm randomly sprawled across surfaces in the quarters he shared with Robin, it was twice as awkward to watch the commander turn, to note the limp nature of his right sleeve, tucked as it was between the buttons of his dark shirt, and not stare at the point where his right arm terminated. He wasn’t even wearing the black leather glove on his left hand today. Perhaps because there were no bionics to be concealed. Daniel forced his eyes to the floor as he followed Domerin into his office, which – thankfully – adjoined the bridge. There he settled awkwardly into one of the comfortable chairs on the far side of Domerin’s desk, trying not to wither under his dark-eyed gaze. 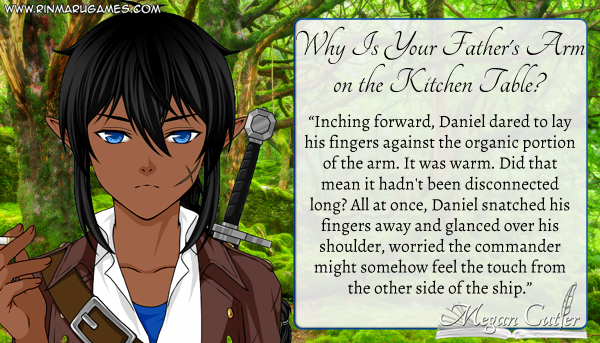 “Is something wrong?” Domerin prompted when Daniel didn’t speak. His tone didn’t exactly demand an answer, but it certainly compelled Daniel to hurry. The light of understanding dawned in the commander’s eyes – at least someone seemed to understand Daniel’s predicament. Daniel’s jaw almost hit the floor. Just how long was the man willing to run around armless? “Don’t you miss it?” he blurted. Instantly, his face began to burn, though he imagined his cheeks draining of all color. Why did he always have to stick his foot in his mouth when the commander was around to see it? “But it’s your arm!” The words came out as an incredulous hiss. He knew the level of trust that existed between Domerin and his daughter, knew that Robin would never do anything that put the man’s bionics at risk. But how could he so blithely live without his arm for days on end while Robin fiddled with it? But… Daniel wanted to protest. But, but, but… He held his tongue, bit the inside of his lip and slunk back through the door to Domerin’s office, fleeing the bridge before the crew could cast too many curious looks in his direction. It was one thing for Robin to be so blithe about her work, but another for the owner of her little science project to be unconcerned with its outcome. The Lorcasf family was so odd. Odder than any he had ever encountered. But the weirdest part of all was that he was considering marrying into it, despite its eccentricities.